CHICAGO – The significant HollywoodChicago.com show business interviews of 2012 – eclectic, independent and varied – flowed throughout the year from the perspectives of Matt Fagerholm, Brian Tallerico and Patrick McDonald. All three contribute to this year-end survey of the 15 Best Interviews of 2012. With so many promotional tours, conventions and shows coming through Chicago, the opportunity to get a wide range of celebrities, filmmakers and up-and-comers is one of the privileges of covering TV and film here. The following interviews – often enhanced with the photography of Joe Arce – were memorable for the timing or circumstance, and the shared give-and-take between HollywoodChicago.com and the representatives of the entertainment world. Emily Hagins (center) directs the cast and crew of her third feature, My Sucky Teen Romance. Background and Behind-the-Scenes: Some 18-year-olds only dream of becoming a filmmaker. By that age, Austin wunderkind Emily Hagins had already landed a distribution deal for her third feature, “My Sucky Teen Romance,” which screened in Chicago before receiving an A-grade Blu-ray/DVD release. What made “Romance” particularly fascinating was how it skewered the “Twilight” craze from the perspective of an actual teenager. Early in her career, Hagins was the subject of a documentary, “Zombie Girl: The Movie,” which accurately captured her infectiously exuberant spirit that has undoubtedly fueled her prolific output (she just wrapped production on her next picture, “Grow up, Tony Phillips”). Background and Behind-the-Scenes: We’ve been lucky enough to interview multiple Oscar, Emmy, and Tony winners at HollywoodChicago.com but Pulitzer Prize winners are a rare breed and a naturally exciting opportunity. 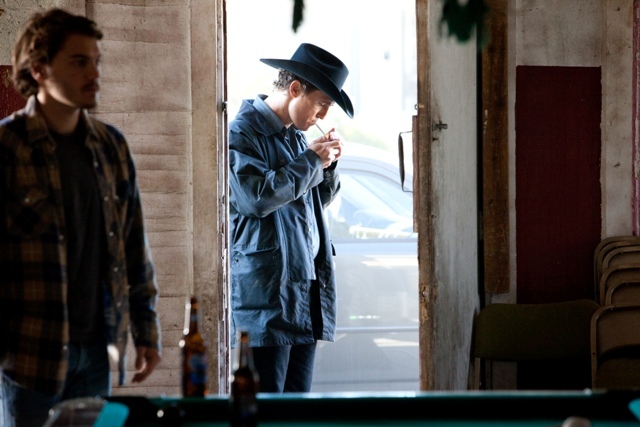 Tracy Letts isn’t just a fantastic playwright, he’s a Chicago theatre icon and the William Friedkin adaptation of his excellent “Killer Joe” caused quite a stir this year with its NC-17 take on film noir. As one would expect, Letts is a thoughtful, interesting man who seems to slowly mull over every question and speaks carefully and intellectually. Exactly what you’d expect from a Pulitzer winner. Opening Notes: I find it virtually impossible to winnow down the many 2012 interview opportunities to just five. So before this begins, I have to mention some more memorable Q&As – look for them through the HC search engine. Young film actor Ezra Miller (“Perks of a Wallflower”), veteran character actor James Cromwell (“The Artist”), rock legends Al Jardine (The Beach Boys) and Dee Snider (Twisted Sister), TV’s Joel Murray (“Mad Men”) and Brenda Strong (“Desperate Housewives”), Ben Lewin and John Hawkes (Director and Lead Actor of “The Sessions”) and the “Sexiest Man Alive,” Channing Tatum. Back to Mr. Wenders. Background and Behind-the-Scenes: The imposing and iconic director Wim Wenders was at the 2011 Chicago International Film Festival to promote his 2012 documentary, “Pina.” His amazing filmography includes “The American Friend,” “Paris, Texas,” “Wings of Desire,” “Faraway, So Close” and “The Buena Vista Social Club.” As testament to his lofty cinema status, the interview was set in an ornate meeting room at a local hotel, where he regaled me with the intricacies of his new film – about famous German choreographer Pina Bausch – and his own storied career. He delighted in bringing back details of his most famous films, including “Wings of Desire,” describing in the quote how he considered choosing actor Peter Falk to portray an angel. Director Benh Zeitlin and actress Quvenzhané Wallis on the set of Beasts of the Southern Wild. Background and Behind-the-Scenes: This year’s winner of the Chicago Film Critics Association’s coveted accolade for Most Promising Filmmaker, Benh Zeitlin has been garnering an overwhelming amount of praise for his directorial debut feature, “Beasts of the Southern Wild.” He coaxed a spellbinding performance from pint-sized newcomer Quvenzhané Wallis, who played the lead role of Hushpuppy, a six-year-old girl in a tight-knit southern village bracing itself for the apocalypse. Dubbed “The Bathtub,” this fictional town is a triumph of production design on an independent budget. Zeitlin even co-wrote the film’s score, which includes the year’s most memorable main theme. Background and Behind-the-Scenes: “Back to the Future,” “Forrest Gump,” “Who Framed Roger Rabbit?” — Robert Zemeckis isn’t just a living directorial legend, he’s a personal icon. I grew up with a “Roger Rabbit” poster on my wall. (Feel free to make fun of how dorky that is the next time you see me.) And so meeting the Oscar winner created a few more butterflies than most interviews in the past. The butterflies were quick to dissipate as the man is as fascinating and insightful as one would expect.